Easter egg decorating was more expensive than usual in Europe this year. 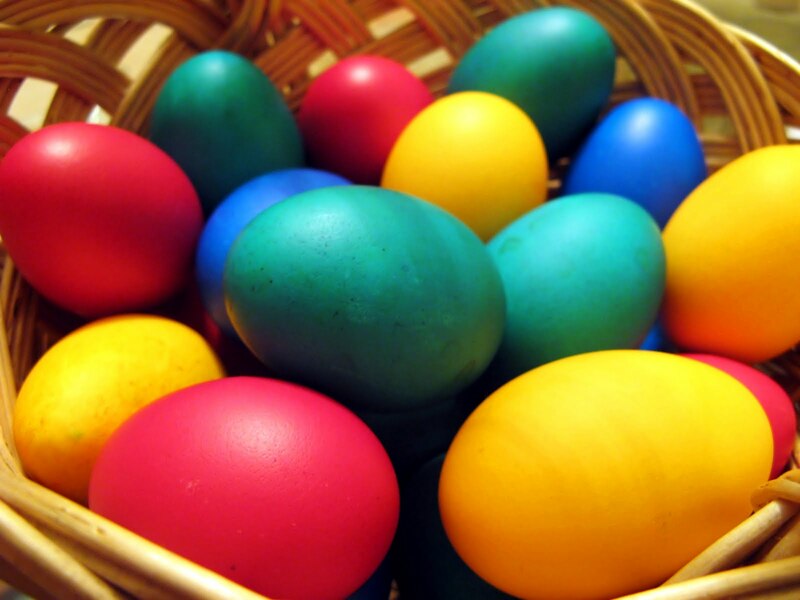 According to the Wall Street Journal, the annual spike in egg prices—due to their use in Easter food and decorating—was much higher than usual. Compared to the same time last year, prices were up by more than 75% across the European Union and had more than doubled in Poland, Bulgaria, and the Czech Republic. What’s different about this year? The beginning of 2012 marked the deadline for implementation of a European Union regulation, first issued in 1999, mandating larger cage sizes for hens. Because egg producers have to buy new cages and then use more space to house the same number of hens and produce the same numbers of eggs, the average cost of producing eggs has increased (assuming that having a larger cage doesn’t increase the number of eggs each hen lays). Consequently, some producers have exited the industry, and the remaining producers require higher prices to produce the same number of eggs. The graph models the consequences of these demand and supply shifts in the egg market, with D1 indicating the normal, non-Easter demand and S1 indicating the supply without a regulation on cages sizes. “D Easter” reflects the increased demand due to Easter, and “S Reg” reflects the shift in supply due to the regulation on cage size. 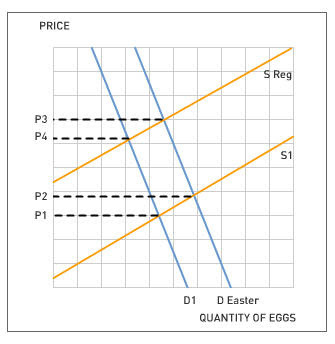 The increased demand for eggs at Easter shifts the demand curve to the right, increasing the price of eggs from P1 to P2. The regulation shifts the supply curve up and to the left, causing a further increase in price (about 75% in this model) to P3. As Easter demand recedes and the demand curve shifts back to normal, the supply curve remains shifted, keeping prices, at P4, above what they were in previous years and, according to this model, above even what they were in previous Easters. The exact price and quantity changes will depend on the size of the demand and supply shifts and the elasticities of the demand and supply curves. While the hens and those concerned with their welfare indubitably appreciate the improvement of their cages, which now have perches and more bedding, better conditions for chickens means higher egg prices for humans. As always, there’s no free lunch, even (perhaps especially) when it includes eggs. 1. How much extra would you pay for an egg produced by hens who got to live in better cages? 2. Assuming that all parts of Europe experience equal shifts in supply (which may or may not be true), what do the larger increases in price in Poland, Bulgaria, and the Czech Republic suggest about elasticity of demand for eggs in those countries relative to Europe as a whole? What other explanations are there for the higher price increase in those countries? 3. California Proposition 2, passed in 2008, requires egg producers in California to provide more room for hens starting in 2015. However, the proposition does not require that California retailers only sell eggs produced in California. What do you think will happen to egg prices in California, egg production in California, and egg production in neighboring states?